Jon Lee – Bristol Acupuncturist Jon gained his BSc. in acupuncture and Chinese medicine at The College of Integrated Chinese Medicine, accredited by Kingson University. This rigorous 3½ year training encompasses both 5-element and Traditional Chinese Medicine (TCM) styles of acupuncture, as well as considerable emphasis on understanding western medicine approaches to physiology, illness and health. For many years, Jon has studied the Hua Gong style of qi gong with Master Zhixing Wang. This beautiful and rewarding practice is particularly useful for health and healing, physically, energetically, emotionally and at the level of understanding our place and purpose in the world. Although Hua Gong is his central practice, he has also studied and is influenced by other approaches and teachers.. Qi gong is an essential influence on how Jon treats his patients as an acupuncturist, and he will also often give exercises to patients to help with their healing. 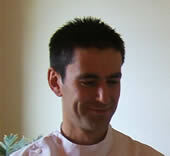 Jon has studied Shiatsu and Thai massage, and has a deep respect for the power of bodywork. This knowledge informs his work as an acupuncturist. Jon originally trained in science and has a PhD in Theoretical Physics from Cambridge University.